Within detail of a photo attributed by William Frassanito possibly to David Bachrach (the “Bachrach photo” — the one in which Lincoln was discovered by Josephine Cobb in 1952 seated on the platform) can be seen what may be the upper portion of a man-made object situated just inside the hollow square of soldiers (see detail, below). Its height and rectangular shape strongly suggest that it was a portable darkroom with an onward facing soldier in front of it — rather than just a moving blur. It is somewhat evocative of a photograph of a portable darkroom positioned near Hanson E. Weaver taken in 1867 by his cousin, Peter S. Weaver, at Culp’s Hill on the Gettysburg battlefield. John J. Richter agrees that the boxed object is a portable darkroom. He speculates that if it wasn’t associated with Peter S. Weaver it may have belonged to someone like inventor/engineer Coleman Sellers of Philadelphia — a member of the small Amateur Photographic Exchange Club who could have attempted that day to photograph with a less cumbersome durable dry-plate. The probable presence of a darkroom within the hollow square of infantry signals that at least one photographer then was situated with his camera inside that area sealed off by soldiers. How a photographer or photographic team managed to place an upright portable darkroom within the hollow square is an intriguing question and raises yet another — was the outer perimeter area of the hollow square as close to the speakers’ platform that any darkroom could be safely placed due to the unyielding and forward pushing crowds? Likewise, mustn’t the camera associated with this darkroom have been situated at the very front of the crowd in order to have any view of the platform? Might this possible darkroom have belonged to the photographer or one of the photographers to whom the journalists referred situated directly in front of the platform who failed to capture Lincoln when he rose to deliver his shorter than unanticipated oration? In a photographic print attributed by William Frassanito to Peter S. Weaver (see detail, below) there can be seen a camera operated by a man seated on top of a tall folding step ladder facing towards the grandstand (boxed in red). He either was perched on some sort of a modified seat affixed to the ladder or possibly on what may be planking (the “Ladder Photographer”). I estimate that the Ladder Photographer was located a distance of at least 50 – 65 yards from the Weaver photo camera. A person to the right of the Ladder Photographer (boxed in blue) could conceivably be David Bachrach or the photographer from Harper’s whom Bachrach assisted. David Bachrach wrote that he took a photo “of the crowd … while Mr. Everett was speaking.” (David Bachrach, “Over Fifty Years of Photography,” The Photographic Journal of America, Vol. 53 (January 1916), at pp. 19-20.) The person boxed in blue perhaps was standing next to a portable darkroom mounted on a tripod (reminiscent of a photograph attributed to Mathew Brady — taken in Gettysburg in July 1863 at the home of John Burns in which John J. Richter in 2003 discovered Brady posing near a portable darkroom on a tripod). 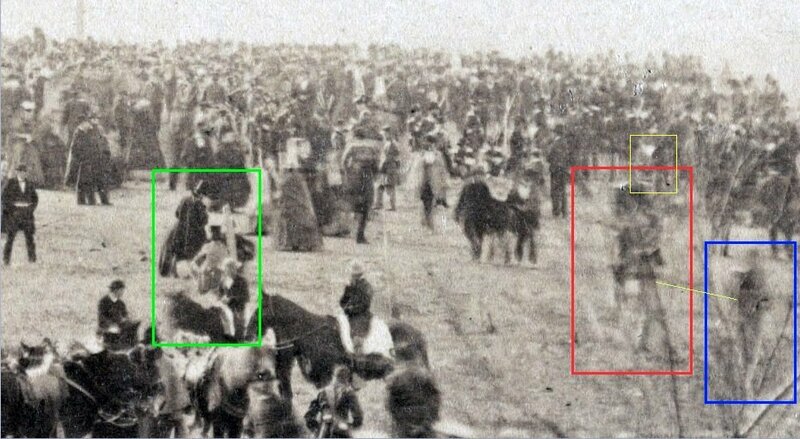 The left side of this cropped Weaver photo image also appears to reveal the backside of two men on horseback hauling a long ladder, boxed in green, probably to be used as a photographic platform (the “Two Ladder Hauling Photographers”). Might these be the late arriving Tyson Brothers on their way to take more photos after having just hauled their photographic equipment and ladder platform up the Baltimore Pike and through the Evergreen Cemetery gatehouse following the shooting of their procession photographs near the intersection of Baltimore St. and Steinwehr Avenue? It would have taken the Tyson Brothers a good deal of time after Lincoln passed them by to develop their third photograph (at least 5 minutes), take down their photographic platform, pack up and secure for transport their chemicals and equipment, and then make their way more than two-tenths of a mile to the Evergreen Cemetery gatehouse before entering the grounds. This view also may show a young man on foot accompanying the Two Ladder Hauling Photographers, possibly their then 13 year-old assistant, William H. Tipton who in later years took over the Tysons’ photography business in Gettysburg. Detail from the Weaver photo showing the Ladder Photographer and his apparent assistant possibly standing next to a darkroom mounted on a tripod, can be seen below. These people are partially obscured by a multi-branched leafless tree between them and the camera. It is possible that the Harper’s photographer whom the then 18 year-old David Bachrach assisted at Gettysburg is the Ladder Photographer seen in the Weaver photo and Bachrach then was charged with manning the darkroom. When these men moved to a location closer to the speakers’ platform, they may have switched their roles. Just above the “Ladder Photographer in the Weaver photo there may be yet another step ladder in the distance (boxed in yellow, above, and circled in red within detail, below) located near soldiers just beyond an apparent corner of the hollow square. This is generally within the estimated area from which the Bachrach photo was taken (“possible Bachrach camera position”). 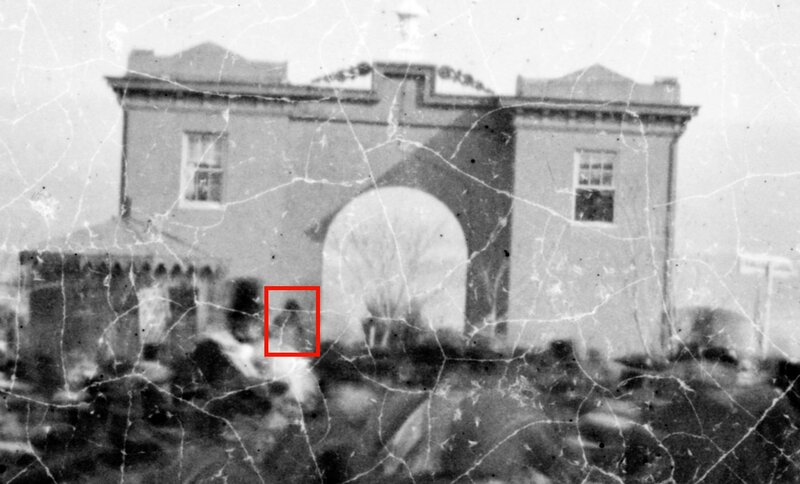 John J. Richter believes that he has located the Weaver photo camera in a second floor open window of the Evergreen Cemetery Gatehouse and points to a single lens camera which can be seen peeking out of that window in the Two Near-in-Time Gardner photos (see circled detail from the LC’s 17807u.tif, below). Although Mr. Frassanito has written that “judging from the perspective, [the Weaver photo] was probably not taken from the second-story window of the gatehouse itself,” a comparison of a tall tree and a sign seen near the gatehouse in that Gardner view to the same tree and sign seen in the immediate foreground of the Weaver photo proves that Mr. Richter is correct. The 2nd floor window with a single-lens camera is circled in red in the top image below from detail within one of the Gardner stereoviews. Boxed in blue is a sign leading into the Evergreen Cemetery warning against the discharge of firearms. Boxed in green appears to be the Ladder Photographer peering over the top of his camera. Detail from the Weaver photo is marked below to show the sign warning against firearms discharge (boxed in blue), the Ladder Photographer (boxed in green) and the tall tree visible in the Gardner stereos near the archway of the Evergreen Cemetery gatehouse as well as the leaning tree seen in the Gardner stereos directly in the center of the archway which partially impeded the view of the Ladder Photographer in the Weaver photo. 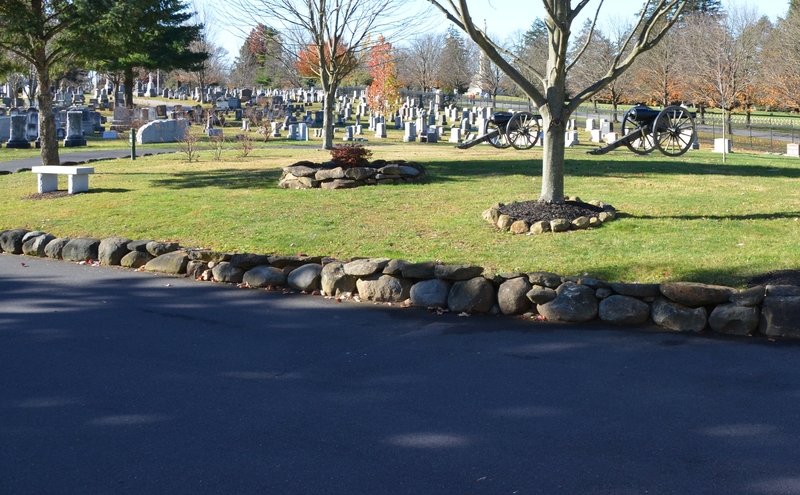 Mr. Richter notes that Mr. Frassanito assigns credit to Peter S. Weaver for a photograph of the Soldiers’ Cemetery grounds taken from a window of the William Duttera House at 380 Steinwehr Avenue. The Duttera house was at least six-tenths of a mile from the Evergreen Cemetery Gatehouse by way of dirt roads clogged at times that day with thousands of spectators. According to Mr. Richter, the logistics of hauling and setting up photographic equipment between such distant points flanking opposite east and west sides of the Soldiers’ Cemetery suggest that it is less probable that Weaver took photographs of the cemetery grounds from both of those locations and more probable that Weaver took the Duttera House photo and someone else who knew the Thorn family residing inside the Evergreen Cemetery Gatehouse — took the other. Potential candidates besides Peter Weaver identified by Mr. Richter are the Tyson Brothers. I believe that men such as Gettysburg studio photographer John S. Speights and his assistant Robert A. Myers are viable candidates too. As noted above, the Ladder Photographer visible in the foreground of the Weaver photo appears to be visible in the background of Gardner’s second stereo view peering over the top of his camera — boxed in red below. By the time that the third Gardner stereo view was taken, the Ladder Photographer doesn’t appear to be visible any longer. 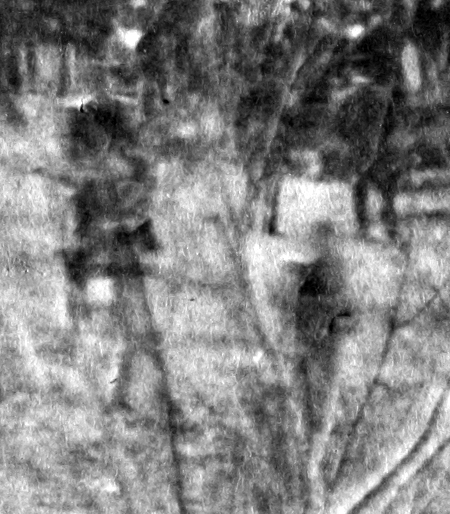 Instead, two other men in top hats — one wearing a dark overcoat and the other covered by a very light colored one — are facing in the direction of Gardner’s camera from a slightly different area to the left and apparently much closer to Gardner. Based upon their outfits, these men may be the late-arriving Two Ladder Hauling Photographers and, therefore, the Tyson Brothers. See the two men facing Gardner’s camera and positioned high above the crowd circled in red within detail from the third Gardner stereo view and the Two Ladder Hauling Photographers circled within detail from the Weaver photo, below. John J. Richter also has located Gardner’s photographic platform in the background of the Weaver photo. With knowledge of the correct location of the Weaver photo camera in the southern second floor window of the Evergreen Cemetery gatehouse, it can be shown that a man framed on the horizon standing several feet above the nearest riders on horseback is in the correct location to be Gardner or one of his assistants (see detail marked with a red arrow below to indicate the location of Gardner’s camera platform, top image below). Gardner was situated an estimated 255 to 265 yards away from the window on the 2nd floor of the Evergreen Cemetery gatehouse. 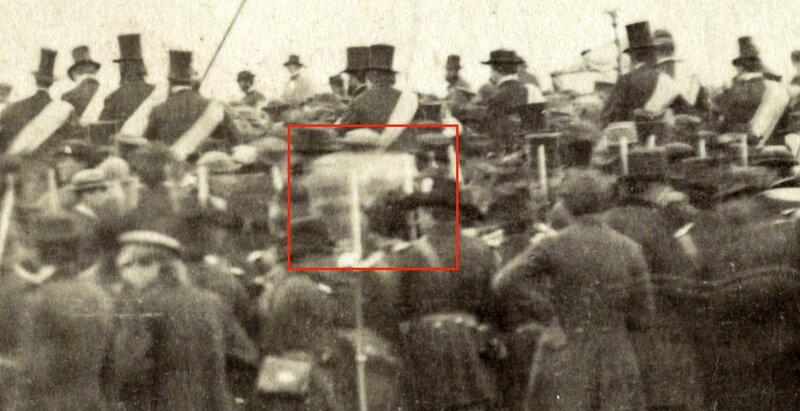 That man appears to be standing behind a dark object which may be a camera (see detail marked with a red arrow, bottom image below). The visual discovery within the Weaver photo of (1) a man standing atop the Gardner photographic platform above an apparent camera, (2) the Ladder Photographer apparently in the act of sighting or taking a photograph, and (3) the Two Ladder Hauling Photographers en route to the location at which they probably are later seen on their own photographic platform in the third Gardner stereo view, is pretty amazing. The discoveries within the Two Near-in-Time Gardner stereo views of the location of (4) the camera used to capture the Weaver photo in the 2nd floor window of the Evergreen gatehouse and (5) the Ladder Photographer peering over the top of his camera are just as intriguing. But when these revelations are combined with the discovery of what appear to be (6) the Two Ladder Hauling Photographers in the third Gardner stereo view — who are not seen in the Two Near-in-Time Gardner stereo views and may well be the later-arriving Tyson Brothers — we can now say that thanks to these SIX clues, it is very likely that the Weaver photo was taken around the same time as the Two Near-in-Time Gardner views. My best guess is that it may have been taken just before those two Gardner stereos. Also, if the Bachrach photo was taken from atop a distant ladder located at the possible Bachrach camera position, the absence of a photographer on that ladder when the Weaver photo was taken supports the conclusion that the Weaver photo was taken prior to the Bachrach photo — and, therefore, possibly close to the taking of the Two Near-in-Time Gardner views. This very probable hypothetical scenario also is buttressed by the fact that the direction of the shadows cast by spectators in the Weaver photo is similar to the shadow directions seen in the Two Near-in-Time Gardner views. 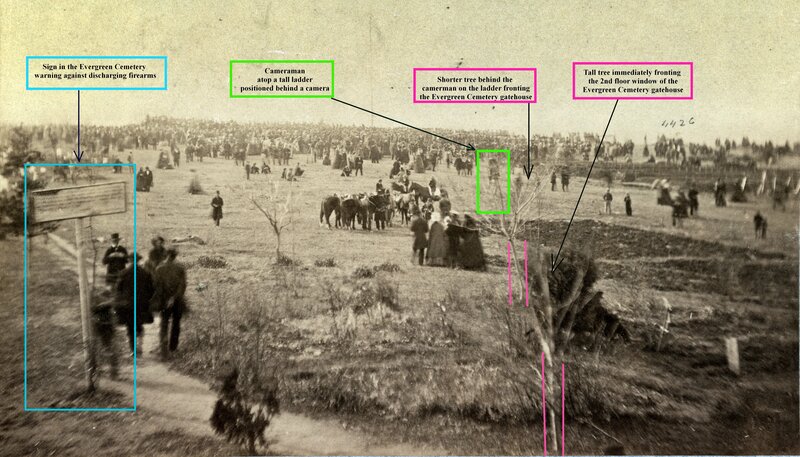 The totality of these observations allows for the consideration of another question — is Lincoln possibly (barely) visible in detail within the Weaver photo (marked beneath a blue arrow in each of the images, below) caught in the act of arriving in front of the speakers’ platform? And if not Lincoln, could it be either a right-handed saluting General Darius Couch, John Richter’s Lincoln candidate, or someone seated or standing on top of the coach parked on the left side of the speakers’ platform? These images inspire one to hope that even more details can be teased out of the dedication photographs and that additional photographs and original negative plates still await discovery. All of the text and marked images contained in this blog are copyrighted; all images are derived from the Library of Congress photographic collection.